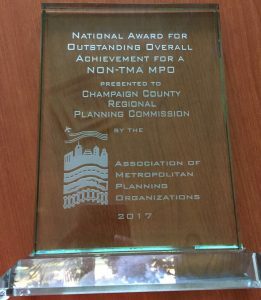 For the fourth time in the past 12 years, the RPC has won a national award from the Association of Metropolitan Planning Organizations (AMPO). 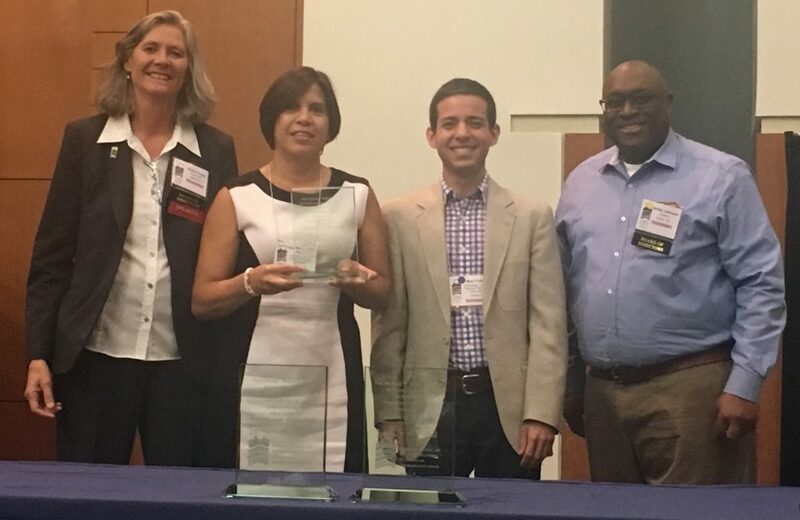 AMPO presented the award for Outstanding Overall Achievement for a Non-TMA MPO to the Champaign Urbana Urbanized Area Transportation Study (CUUATS) for its Sidewalk Network Inventory and Assessment. CUUATS is a program of the RPC. Presented annually to a Non Transportation Management Area—communities or urbanized areas with a population of less than 200,000 people—the award recognizes a project’s innovation, impact on the profession, implementation, and coordination. The Sidewalk Network Inventory and Assessment began in May 2014 as a collaborative effort to create a comprehensive database of sidewalk features within the Champaign Urbana Urbanized Area. It was designed to assess and track the condition and compliance with the Americans with Disabilities Act (ADA) of the sidewalk network, as well as highlight potential improvements. The RPC has now won this national award four times since 2005. “The Champaign County Regional Planning Commission’s nomination stood out for the innovative open-source software tools developed in-house and its potential for replicability by other MPO’s,” commented AMPO Executive Director DeLania Hardy. In April of this year, CUUATS published the Sidewalk Explorer, an interactive web app that allows the public to see spatial and temporal trends in the region’s accessibility, and to view scores and photos of individual sidewalk features. The Sidewalk Network Inventory and Assessment used relatively low-tech, readily available measurement tools in combination with high-tech custom software tools for automation, analysis, and visualization. These software tools are now freely available to other agencies in CUUATS’s open source software repository. CUUATS implemented the Sidewalk Network Inventory and Assessment in cooperation with a working group of representatives from the Cities of Champaign and Urbana, the Village of Savoy, the University of Illinois, and Illinois Department of Transportation (IDOT) District 5. An IDOT Technical Studies Grant provided initial funding. Both the Inventory and Assessment and the web app have already prompted inquiries from government agencies outside the region interested in implementing the data collection and analysis procedures documented in the project report. The use of off-the-shelf measurement tools and custom software tools developed in-house also allowed CUUATS staff to collect and analyze the sidewalk network data at significantly lower cost than many previous sidewalk assessments. At approximately $362 per mile, the CUUATS inventory and assessment process cost less than half of the per-mile price of one of the prior assessments on which it was modeled. AMPO is the transportation advocate for metropolitan regions and is committed to enhancing the abilities of MPO’s to improve metropolitan transportation systems. The award was presented during the 2017 AMPO Annual Conference, which took place October 17-20, 2017, in Savannah, Georgia.